Open daily for breakfast, lunch and dinner, Flower & Wolf also has a weekday happy hour featuring select cocktails for $6. Inside the restaurant you'll find cool, mid-century modern and industrial design and a hand-sketched drawing of the downtown Calgary skyline on the back wall. Photograph courtesy of Flower & Wolf. The days of bad hotel food are thankfully slipping away. In recent years, there’s been a growing expectation that a hotel restaurant’s menu and design should stand up in competition with other restaurants around the city. Flower & Wolf does just that. 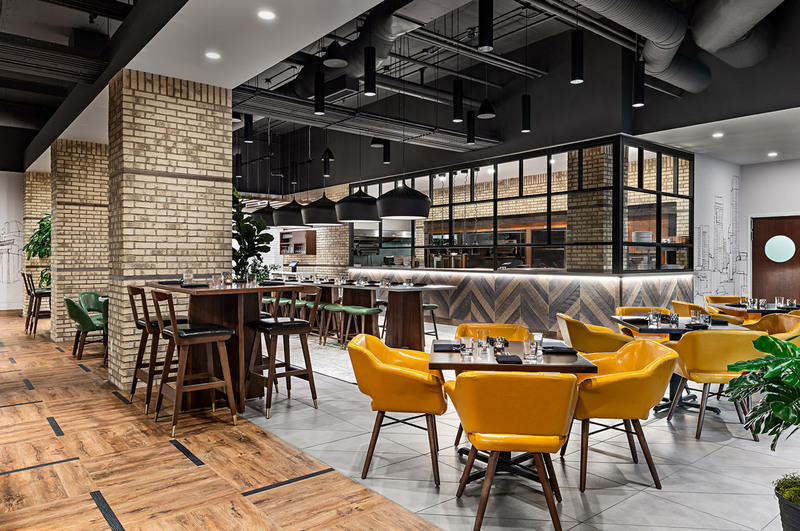 The new restaurant opened in June in the space formerly occupied by Barclay’s in the Sheraton Suites Calgary Eau Claire hotel. It’s the first franchise under the Flower & Wolf brand for Toronto-based restaurant group Iconink. The menu features familiar dishes that surprise with bold flavours, such as eggs Benedict for breakfast (offered daily), house-smoked brisket for lunch, maple glazed salmon for dinner and bannoffee pie for dessert. There’s also a very long list of cocktails, beer and wine. The large corner restaurant can be accessed from within the hotel or from the street on Barclay Parade S.W. Inside, floor-to-ceiling windows brighten a space filled with chic, mid-century modern-inspired leather chairs, dark wood tables and industrial-style light fixtures. There’s also a bar and a streetfront patio with couches and a fireplace. Be sure to take some time to admire the hand-sketched drawing of the Calgary downtown skyline on the wall to the left of the bar. Executive chef Cole Glendinning, along with executive sous chef Kate Symes, took on the challenge of building a menu that met the needs of the Sheraton’s clientele while still appealing to locals as a standalone restaurant. “We can create [familiar dishes] and still really wow people. It goes a little bit further than just simple food.” says Glendinning, who previously worked as a sous chef at Fairmont properties in Banff and Jasper and returned to the west in May 2017 from The Fairmont Royal York in Toronto. The “wow” factor, he says, comes from quality ingredients such as cold pressed canola oil from High River’s Highwood Crossing in the red lentil hummus or the zesty yuzukosho butter that changes everything you ever thought about ordering spinach as a side. Glendinning has an affection for smoking and curing meat, so the smoked eggplant dip, the brisket hash and the smoked maple syrup used in the Canadian Mutt cocktail are all done in-house. 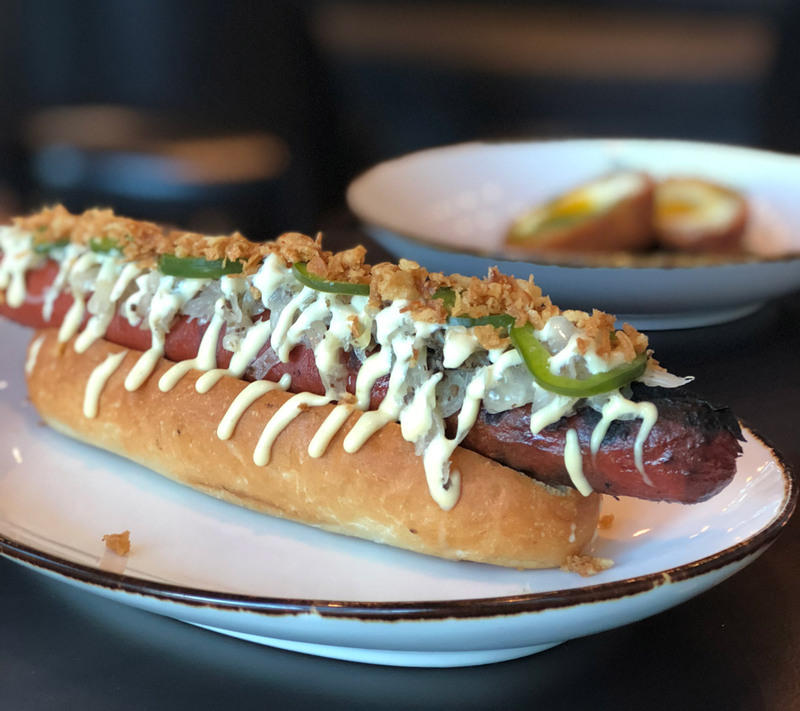 The footlong wagyu hot dog is available at lunch and dinner and is topped with truffle sauerkraut, crispy onions, dijonnaise, pickled jalapeos and chips. Photograph courtesy of Flower & Wolf. The footlong wagyu hot dog is available at lunch and dinner and is topped with truffle sauerkraut, crispy onions, dijonnaise, pickled jalapeos and chips. While the restaurant is a franchise, Glendinning says that it was important that he and Symes work with Alberta producers. “We really looked at what we knew would sell well in the city and what we really stood behind as ingredients,” he says. In true Alberta fashion, the menu has six cuts of dry-aged beef including a whopping 32-ounce tomahawk rib steak. It was also important to the team to make the price point of the food and beverages approachable. There are pizzas for $11 and most of the mains range between $17 and $25. For several of the cocktails, you can choose from three brands of liquor that vary in price. So, you can get an Old Fashioned or a Negroni for $9, $12 or $15. There’s also a weekday happy hour from 3 p.m. to 6 p.m. featuring select cocktails for $6 and snacks like pancetta flatbead and ahi tuna tartare.